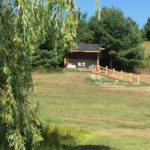 This unique structure has been built with “old school” timber frame methods out of local forests and erected by friends of Rocky Top Farm. No electric “off grid”. Portapotties. Secluded on 50 acres. Queen bed- fresh sheets and towels. Large fire pit. Come enjoy our beautiful location.